CHARLOTTE, NC--(Marketwire - Feb 14, 2012) - Guests at the Renaissance Charlotte SouthPark Hotel will never see a housekeeping cart in the guest room hallways again. According to General Manager Kris Horacek, the luxury Charlotte hotel's cartless housekeeping program has been so successful that she doesn't see them ever making a comeback. "We began to adopt a cartless program a few years back when I took over management of the hotel," notes Ms. Horacek, General Manager of the boutique hotel in Charlotte, NC, "and it has had a number of benefits. 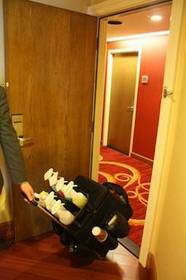 Not only does it leave the hallways free of the carts overflowing with dirty linens and trash, but it also enables hotel guests to more easily navigate the hallways with their bags, they don't visibly witness the service of their rooms so it all appears to happen by magic, and perhaps most importantly from a bottom line standpoint, it dramatically improves productivity as the housekeeper/room stylist doesn't need to load and unload carts with linen and product every day." 1. A houseperson goes into each room and collects the linen, strips the bed if need be, and collects the trash. Keycards are coded with red or green to note which rooms need the beds to be stripped. 2. The housekeeper/stylist then goes into each room, taking with them a vacuum as well as a specially designed cart on wheels (pictured above) which holds cleaning products as well as hidden drawers for the luxury hotel's Aveda products and other items which he/she will need to make up the room. There is also a linen closet on each floor where the housekeeper can access clean sheets, towels, etc. 3. The room is then inspected and the toilet tissue is embossed with the signature "R" which signals that the room is now customer ready. And the Renaissance Charlotte SouthPark, one of the premier 4 star hotels in Charlotte, NC is not the only property in the Marriott Hotels & Resorts group which has adopted this program. A number of properties across the brand are also using cartless housekeeping including the Newark Liberty International Airport Marriott in New Jersey. The AAA-rated Four Diamond Renaissance SouthPark Hotel is a sophisticated, contemporary, and inviting luxury hotel that completed a multi-million dollar renovation last year. The property is located in the affluent SouthPark neighborhood, just a few minutes south of uptown Charlotte, North Carolina. The hotel has 264 guest rooms, an indoor pool, fitness center, Flagstones Restaurant, and The Bar at Flagstones. For additional information, visit http://www.marriott.com/hotels/travel/cltrp-renaissance-charlotte-southpark-hotel or call 704-501-2510. RENAISSANCE HOTELS is an upscale brand with more than 145 properties in 32 countries that speaks to passionate travelers in search of authentic local discoveries when traveling for business or leisure. Renaissance Hotels has recently welcomed several new "gems" to its global collection -- the boutique Renaissance Malmo hotel in Sweden, the historic Stanford Court hotel in San Francisco, the exotic Renaissance Curacao Resort in the Dutch Caribbean, the opulent Renaissance Bangkok Ratchaprasong Hotel and the modern Renaissance Beijing Capital Hotel. These hotels join a rich portfolio defined by distinctive and well-known icons such as the Eden Roc Renaissance Miami Beach, La Concha Renaissance San Juan, Renaissance New York Hotel 57 and Renaissance Paris Arc de Triomphe. All Renaissance hotels participate in the award winning Marriott Rewards® frequent travel program that allows members to earn hotel points or airline miles for every dollar spent during each stay. To make reservations and for more information visit www.renaissancehotels.com. Follow Renaissance on Facebook at www.facebook.com/RenaissanceHotels, on Twitter at www.twitter.com/RenHotels, and via the RLife blog at www.therenaissancelife.com. Visit Marriott International, Inc. (NYSE: MAR) http://www.marriott.com/corporateinfo/boilerplate.mi for company information. And the Renaissance Charlotte SouthPark, one of the premier 4 star hotels in Charlotte, NC is not the only property in the Marriott Hotels & Resorts group which has adopted this housekeeping program.